This book summary is part of an ongoing project to summarise ~70 books on Personal Productivity - for more, see the full reading list. You’d like some practical advice on cultivating and stamping out habits. You’re frustrated that your life isn’t changing as fast as you’d like it to. You’re sick of “quick wins” and you’re ready for serious long-term self-development. Darren Hardy’s Compound Effect is in my favourite class of productivity books: it’s concise, it’s next-action focussed and it comes with a ton of free templates that are worth 10x the cost of the book. It also reinforces a message I’ve seen, learned and taught time and again. Big results don’t come from grand talk or gestures. Big results come from clarity plus small, deliberate actions – made and repeated until actions reap a habit, habits reap a character and character reaps a destiny. In other words, the tortoise ALWAYS beats the hare. And when you think you’ve seen otherwise, you’ve invariably confused the last lunge for the finish with the journey that led to its end. These ideas are at the core of Darren’s philosophy – and they’re also the beating heart of FASTER TO MASTER‘s TRACKTION methodology. Of course, the “What?” is always simpler than the “How?”. Luckily, this is precisely where The Compound Effect really shines. What follows below is my brief synthesis of the lessons you’ll find in the book. But for anyone serious about jumpstarting their income, their life and their success – I’d suggest grabbing your own copy here. 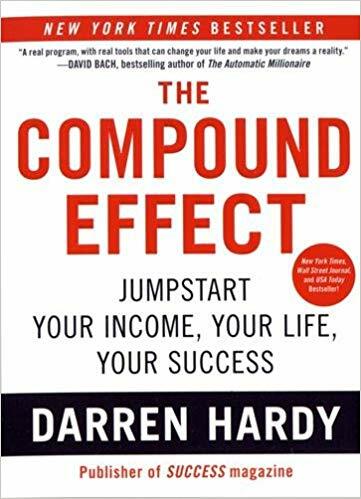 The Compound Effect “is the principle of reaping huge rewards from a series of small, smart choices,” made consistently, over a long period of time. For example, would you rather have (A) $3 million upfront or (B) one penny that doubles in value every day for 31 days? To maximise your gains, the correct answer is (B). But it doesn’t happen quickly. After 19 days you’d still only have $5,243 and you might feel pretty foolish next to a friend who chose option (A). Figure 1: The magic penny example demonstrates the compound effect in action. This example shows the power and subtlety of compounding. The choices that lead to life-altering change are, on the surface, disarmingly small. The good ones are easy to overlook and the bad ones are easy to forgive. What’s more, cause and effect are so distant that they’re hard to connect. Compounding requires enormous amounts of patience and faith. And that’s a problem because humans aren’t programmed for patience or faith. We’re programmed for instant gratification. And that programming runs deep. In the uncertain world of our ancestors, passing up chances to flee, feed or fornicate were shortcuts to physical or genetic death. Even today, the social pressure to keep up with peers, even when we know we’re making poor long-term decisions, is an almost invincible addiction. But compounding is real. And it’s powerful. And it’s defining the course of your life, right now, both for and against you, based on every decision you make. So, what’s the first step to tip the balance in your favour? The answer is to take full responsibility for your life. Think about it – if small choices made consistently lead to big outcomes, it follows that many big outcomes come down to small choices. The 10 minutes you read before bed. The 15 minutes you snooze in the morning. The 100 calories you don’t need at lunch. Every thought you repeatedly have, every impulse you often indulge, every decision you consistently make contributes to some kind of compounding. Even if you can’t match cause with effect your life is the product of your choices. Decide to take full ownership of your life – even if you can’t explain how you got here. Write down 6 seemingly inconsequential positive steps you can start doing daily. Identify 6 seemingly inconsequential negative actions you can put a stop to. Identify any areas of life where you’ve enjoyed success in the past but may have become complacent and are no longer improving. So if it all comes down to the choices we make, how do we get better at making them? The answer, like compounding, is disarmingly simple: stop living on autopilot and start making conscious decisions. Choose 100% responsibility for your relationships. Choose 100% responsibility for your setbacks and the lessons they’ll teach you. Choose 100% responsibility for your luck. Remember always that “Luck = Preparation + Attitude + Opportunity + Action” and that you can choose to influence or neglect each part of that sum. Choose to make conscious choices about even (/especially) the smallest of choices in any part of life you want to transform. How? “You can’t manage what you can’t measure,” so choose to start tracking every action in the part of life that you’re focussing on. Want to lose weight? Track your weight. Track your measurements. Track your calories. Track your steps. Track the minutes you exercise each day. Track anything and everything that compounds you towards or away from your goals. Start slowly. Track one habit for one week. Then add to your list until there’s not a choice, big or small, you don’t know about. At first, you’ll be shocked. Not just at the state of your choices but also at how hard it is to stay conscious of them. But before long you’ll be surprised then delighted at the power of clarity in shaping your actions. The most important choices of all? Choose to start early. Choose to start now. Because the sooner you start making conscious choices, the sooner you can turn those choices back into habits. And that’s when the real magic begins. Identify the one area of life you’re struggling most with and start journalling all the things you’re grateful for about it. Identify and assess an area of life you want to change and that you’re not taking 100% responsibility for. Start tracking at least one behaviour in one area of your life you’d like to change and improve. Habits are “an acquired mode of behaviour that has become nearly or completely involuntary.” They’re choices on autopilot. And they grow stronger with each repetition. Most people let their habits form unconsciously. Those habits then dictate the choices that determine the course of their lives. Taking control of your life means mastering your habits. It means taking full responsibility for creating good habits while removing the bad ones. Identify and create the good habits you’ll need to reach your goals. Set concise, compelling and awe-inspiring goals – see Darren’s Goal Designing Cheatsheet in the templates above). Identify your triggers – what, who, when or where are the triggers that kick-off the behaviour you want to stop? Either: Ease into your new reward – some habits are easier to change by cutting them down slowly. Or: Make a hard change – others are more easier to dislodge with a quick decisive tug at the roots. N.B., You may not want to totally eliminate all your vices – and that’s OK! If there’s something you enjoy – but know can get out of control – periodically abstain from it for a 30-day period to prove to it and yourself that you’re still the one driving. Celebrate – training your brain is much like training a dog so don’t underestimate the power of small, simple rewards for good behaviour. And remember: Change is hard, and that’s a good thing. Be patient with yourself, stick with it, don’t get distracted and stay focussed on the simple but profound disciplines that lead to success. Practice designing concise, compelling and awe-inspiring goals. Consistency and persistence are critical ingredients in compounding. But making active daily decisions and deliberately changing your habits is hard. It’s easy to fall off the wagon. And it’s precisely at moments like these where momentum will give you an edge. You’ll recognise momentum when it feels weird not to do something that’s become a regular part of your day. It’s the gyro that keeps you upright when you wobble. It’s the wind that lifts you over your hurdles. How can you create it? One powerful way is to master your daily routines. And the most important routines are ones at the start and the end of your day. As long as you control your mornings and evenings you know you can start and end strong. And a strong start and finish are your best chance at consistently winning. Visualise my number 1 goal and 3 actions to progress it. Set 3 most important tasks for today. Compare actuals with plan – Ask: How did today go compared to how I thought it would go? Why? Reflect on new ideas and insights – Ask: What did I learn today? What can I use to make tomorrow better? Read 10 pages of an inspirational book – If you’re stuck for ideas, you’ll find plenty of suggestions here. An interesting point: If you notice something in your rituals that used to energise you but is no longer generating powerful results, don’t be afraid to change up your routine. Your rituals are there to help you so don’t let rigid thinking get in the way of a good outcome. What next? With your daily rhythm in check, start focussing on your weekly, monthly and quarterly rhythms. Darren suggests using a Rhythm Register to keep track of regular habits and actions. You’ll find a template among his free downloads and a similar system in this free PDF of F2M’s TRACKTION Planner. Most important of all? Make your new habits and rituals sustainable. Going from couch potato to 8 miles a day, overnight is a guaranteed path to burn out and injury. That inconsistency is very expensive. It takes a lot of energy to get a derailed train back on the tracks. The same lesson goes for your routines. Sustainability leads to consistency, consistency creates momentum and momentum makes it easy to stick to your rhythm. In other words: be realistic and ease into your new lifestyle gradually. Build your bookend evening and morning routines. List three areas of life where you’re not consistent enough. What has this cost you? Decide to be consistent from now on. Create a rhythm register and write down a half-dozen key behaviours. Change is a hard enough challenge without trying to paddle upstream. That’s why, one of the most important steps you can take to jumpstart your success is to consciously tailor the information, associations and environment that you swim in. Your brain is an information processing machine: garbage in, garbage out. Join Drive-Time U – Absorb audiobooks and courses whenever you’re hands free. Wherever you are, whatever you do, you are constantly bombarded by data. Make it your mission to replace as much of the hateful, harmful and downright unhelpful sources as you can with healthy alternatives for a wiser, happier existence. The people you associate with (your “reference group”) determine as much as 95 per cent of your success or failure in life. Evaluate your current associations – Are you surrounded by people who love, support and inspire you? If not, why not? Visualise your ideal associations – If you could bring five imaginary friends to life, what or who would they be like? Weed out the worst ones completely – Where immediate elimination is hard, find ways to increasingly avoid or distance yourself from bad actors. Consciously limit what’s left – When it comes to loved ones, quality is far more important than quantity. Expand and replicate the best ones – Ask: Where do people like my best friends hang out? How can I make more friends like these? Next, find yourself one or more peak-performance partners – people who share the same goals, values and determination to become their best selves as you do. Create a lasting bond of accountability with weekly calls and messages to hold each other accountable. Last up on our checklist of influences is taking ruthless control of your physical and mental environment. Eliminate all the incomplete, poisonous clutter (both mental and physical) that you can from your life. Identify the influence of media and information on your life. Identify ways to protect it from negative and flush it with positive information. Evaluate your current associations. Which must you stop or limit? How will you expand your associations? Pick a peak performance partner and decide when, how often, what to and how you’ll hold each other accountable. Identify three areas of life you are most focused on improving. Find and engage a mentor in each area of those areas. Giving a little more energy or your thought to your efforts won’t just improve your results, it will multiply them. We all face moments of truth, or walls when it feels like there’s nothing left to give. Approach these moments not as obstacles, but as opportunities. First, understand that it’s only after these walls that real growth happens. Everything up to the wall was just a warm-up. Second, know that everyone else is facing the same wall, and the vast majority will give up, which is why the open plains success lies on the other side of it. Stand out from the crowd. Do the unexpected. Look for as many opportunities to surprise and “WOW” others as you can with the level, speed and originality of your accomplishments as possible. Don’t just choose to meet expectations, choose to do better and then choose to do better than that. Take extraordinary action. Harness the compound effect. And you’ll find yourself well on the way to jumpstarting your income, your life and your success. Identify times when you hit your moments of truth and commit to pushing through them when you next get there. Find three areas in your life where you can do “extra” and make a plan to do more. Identify three areas in your life where you can beat expectations then plan where and how to create “wow” moments. Identify three ways you can do the unexpected. Where can you differentiate from what is common, normal or expected? Darren Hardy’s Compound Effect is a powerful book with a simple message – disarmingly small choices remade consistently over time lead to life-altering changes, and those forces can work for or against you. Simple, but not easy – which is why The Compound Effect is filled with practical actions and templates (many of which you can download for free from Darren’s website, here). But now the ball’s in your court and your choice is straightforward. You can leave this summary and continue your life as it is; you can sink back into your comfortable flow; you can leave your choices to chance and in 5, 10 or 15 years, you can reap the haphazard harvest that’s taken root in the garden of your life. Or you can choose ONE thing that you’ve learned here today and take action; you can put your fate in the power of compounding; you can take responsibility for the forces that are shaping your future and you can decide to become more extraordinary. If you choose progress, you might want to check out F2M’s TRACKTION Planner – a simple, no-nonsense tool I designed specifically to help me and my coaching clients create the clarity, focus and accountability we need to build new habits and accomplish more of what matters each day (N.b., you can also download the free PDF version here). But in any case, thank you for stopping and I hope you enjoyed this book summary of Darren Hardy’s Compound Effect. Good luck, go well and be awesome. Extremely helpful and practical as always Arthur. Thanks! You’re welcome, Kieran – glad you enjoyed it!